ESA's Rosetta spacecraft nears comet 67P/Churyumov-Gerasimenko in this artist’s interpretation. The spacecraft's navigation camera obtained the comet image on August 2, 2014, at a distance of about 311 miles (500 km.). The spacecraft rendering does not match the comet in scale. 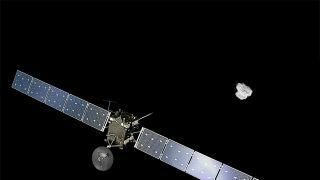 After an epic, decade-long trek across the solar system, the European Space Agency's Rosetta spacecraft will finally catch up to its target comet early Wednesday (Aug. 6). If all goes according to plan, Rosetta will become the first probe ever to orbit a comet, and you can watch the historic rendezvous live online. Rosetta is expected to meet up with Comet 67P/Churyumov-Gerasimenko at 4:45 a.m. EDT (0845 GMT) Wednesday, with a crucial 6.5-minute-long engine burn propelling the spacecraft into the comet's orbit. You can watch a live webcast of all the action here at Space.com beginning at 4 a.m. EDT (0800 GMT), courtesy of the European Space Agency (ESA). Rosetta blasted off from French Guiana in March 2004. During its 4-billion-mile (6.4-billion-kilometer) chase, the spacecraft zoomed around Earth three times and Mars once for "gravity assists" that helped the spacecraft pick up speed. Rosetta also got up close and personal with two asteroids during its travels. When Rosetta reached Jupiter's orbit in 2011, ESA engineers put the spacecraft into a deep-space slumber that lasted more than 2.5 years. Rosetta woke up in January this year for the final phase of its journey to Comet 67P, which is about 2.5 miles (4 km) wide and takes roughly 6.5 years to complete one lap around the sun. Rosetta has since performed a series of complex maneuvers to slow down and match the comet's pace. Now, the probe is poised to enter the comet's orbit and travel with it around the sun. Rosetta is also carrying a lander called Philae that's expected to touch down on the comet in November to take samples and study the comet's surface and composition. Comets are some of the oldest celestial bodies in the solar system, and ground observations have revealed that these icy wanderers are rich in organic material. Comets that pummeled Earth during the planet's infancy could have brought the essential ingredients for life, researchers say. ESA scientists hope studying comets more closely will reveal information about the origins of life on Earth and the origins of the solar system. The Rosetta mission is slated to end in December 2015.